As Sam Cooke famously sang, “It’s been a long time coming.” For several things, actually. 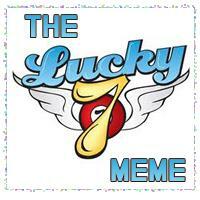 It seems like ages ago that Therese Walsh tagged me for the Lucky 7 Meme. And it’s been even longer since I did a blog post. I was just out of the box on blogging, and…Boom! Had a relapse of my radial tunnel syndrome. But I’m not here to whine, and I am feeling much better. Thanks to all of you who’ve sent me well-wishes through the last few weeks. “My Lord, it is not my place to question my queen. I care only that she bid us to seek you, and you alone.” Icannes tilted her head and waited. The others cast their eyes to the floor as well; all but the eldest boy, whose defiant eyes remained locked on his. Thadmeir rose, stepping down from the dais to stand before the son of his brother’s killer. He was chagrinned to see that the young man was already as tall as he, and perhaps even outweighed him. Has it really been so long, that the product of that despicable union is nigh a man already? So now I’ve got to find seven to tag who haven’t already been through this. My apologies if you have. Everyone else, please check these guys out. They’re all wonderful tribe-mates. No pressure to play. You can do your own post, but I know some of those I’m tagging don’t blog. So you can put your seven lines in the comments here, put them in the comments to the facebook link, or keep your seven to yourself until release day. It’s up to you. Whatever you choose, may the odds be ever in your favor. I do plan on posting a few blogs in the near future, so please stay tuned. I love this meme, but sometimes feel lost when I read from this spot. So, I appreciate the background. Now, I just need a publication date, so I can read the rest of it. 🙂 I’m working on it, Stacy. Thanks! Love it! I’m intrigued and immediately found myself in the scene. I agree that adding the background was helpful, I should have done that with my own. I’ll check out some of the others you’ve tagged as well! Thanks, Nicole! I’ve been loving seeing these, including yours. Such an interesting exercise. So fun to see what you are working on, Vaughn. Hope the hand is better soon. Thanks, Liz! And I’m getting better every day. Even getting pretty good typing in a wrist brace. Did you change the background on your blog, Vaughn, or am I losing my mind? Regardless, I like it. Masculine, warm, and readable. Love the excerpt, too. I can see why you and Teresa Frohock bonded. 🙂 You have overlapping sensibilities. Yes, what Jan said! – and oh I am terrible with follow through on these things even when I selfishly am all a giddy when someone mentions me in a tagging thing *laugh* — lawd. So glad you are feeling better, dear vaughn! No worries, Kat! If you don’t follow through, I’ll just have to gets me a copy of Family Graces and look the darned lines up myself. 😉 Thanks, and congrats on the new book! I love seeing a sneak peek at your prequel! I love prequels. My seven is pretty boring. It’s part of a rough first draft so don’t hold me to it! My main character is Kay (my middle name of course 😉 ) and she meets the newest arrival to town at a bake sale. She’s married, it’s not a romance, but it just shows how we gals can have our awkward moments too. Her inner thoughts should be italicized. He stood so tall that Kay had to lift her chin high just to see his face. Wow, this guy has to be at least 6’4” or 5”; I bet he’s the new basketball coach. “I haven’t seen you around here before; I bet you’re the new coach.” Inside her head she groaned, Now who’s making dumb observations? He paid Mrs. McD for three dozen cookies, and a pie. “I guess this really is a small town. Yea, I’m the new coach, John London.” He reached out his hand and Kay shook it. Cool, Valerie! Isn’t it interesting that we both have characters meeting? Wish I had Coach London’s metabolism. 😉 Thanks so much for playing! Thanks, Heather! Whenever you’re ready, Busy Girl. 😉 I’d love to have your thoughts. Loving the suspicion of drama-mama, and the revelation. This is Madonna leaving Roycroft, right? These little glimpses are amazing. This is such a fun game. Thanks for playing, Kim!